On October 10th, 2018, the Department of Homeland Security published an update to the “public charge” rule that would force immigrant families to make the decision between invaluable programs supporting food, housing and health and keeping their family together in the U.S. This is not a choice that anybody in the U.S. should have to make. Public benefits belong to all who are eligible. WhyHunger strongly opposes the proposed “public charge” rule and believes that we cannot stand for such an attack against immigrant families. Before this proposal goes to vote on December 10th 2018, learn more about the issue and add your voice to stand up for the basic human rights and dignity for all people. For years, the “public charge” test has been implemented to identify people dependent on government benefits as their main source of financial support. 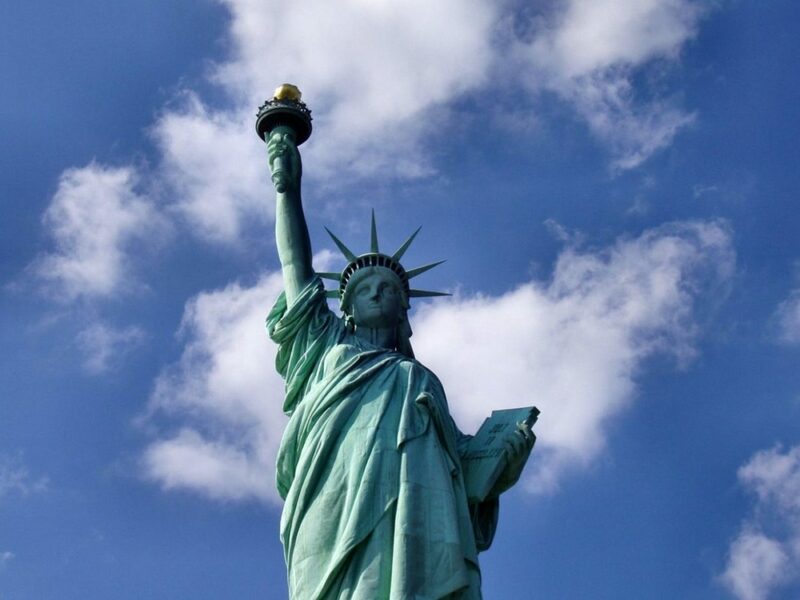 Those determined likely to become a “public charge” can be denied a green card or even permission to enter the U.S. on this basis. Under the current policy, the only programs that can be taken into account when determining an individual’s case are cash-assistance programs and government-funded, long-term institutional care. The current proposal under consideration will change the “public charge” test dramatically, expanding the number of factors that can be used against an applicant. Most importantly, the definition of a “public charge” would change from somebody who relies on public benefits as their main source of support to somebody who simply participates in health, nutrition or housing programs. These include: Medicaid, Supplemental Nutrition Assistance Program (SNAP), formerly known as “food stamps,” Medicare Part D Low Income Subsidy, which provides assistance purchasing medicine, and Federal Public Housing, such as housing vouchers and rental insurance. While the Department of Homeland Security states that the rule would improve self-sufficiency, advocates caution that it would actually discourage people entitled to these benefits from participating in the programs that help them secure their most fundamental needs and lift people out of poverty. Should the proposal go into effect, it would create lasting damage and negatively impact the health and wellbeing of millions. Already, immigrant families are disenrolling from programs such as SNAP out of fear that these programs could put their residency status at risk. The passing of this rule would only amplify this trend and what is worse, confusion around this law may lead to disenrollment from programs that are not even covered in the proposal including the Special Supplemental Nutrition Program for Women, Infants, and Children (WIC). As people who are legally authorized to participate in SNAP and other programs refuse assistance, we will likely see numerous consequences including increased rates of poverty and housing instability, negative health incomes like increases in obesity and malnutrition, and even a rise in communicable diseases. Households will have less money for food and may be forced to forego necessary medical treatment. For a full breakdown of the impact this rule would have, see the Resources page put out by Protecting Immigrant Families and a piece by WhyHunger’ board member Janet Poppendieck. The proposal is still just that: a proposal. There is still time to act. 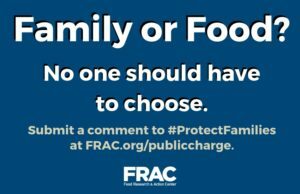 Join WhyHunger, FRAC, the Protecting Immigrant Families Campaign and take a stand against the changes to the “public charge” rule. Until December 10, 2018, the comment period on the Federal Register remains open, leaving just over a week for the public to voice their opposition. You can explain why you are against the proposal directly through the Federal Register here, or you can submit your comment through the Food Research & Action Center (FRAC) here. Submit your comment today to take a stand and ensure that nobody is forced to choose between food and family. This post was written by Elena Seeley, a communications intern at WhyHunger. Elena is pursuing a Master’s in Food Studies at NYU.